The Two Mrs. Carrolls is an intriguing experiment in casting against type that doesn’t quite pay off as expected. Drawing inspiration from far better films like Suspicion and Gaslight, The Two Mrs. Carrolls is a B-list film with A-list actors. However, the actors feel as underwhelming as their characters, leading to a miasma of missed opportunities. It’s a quick little thriller, but there’s far too many sequences that make you question why the director wanted the performance that way, and ultimately have you wanting to watch the actors in better work. Sally (Barbara Stanwyck) has recently married widower/painter Geoffrey Carroll (Humphrey Bogart). The two have a seemingly idyllic relationship until Geoffrey meets the wealthy Cecily Latham (Alexis Smith). As the two start to grow closer, Sally starts to wonder what happened to the first Mrs. Carroll and whether she’ll be the next to “come down” with something. The Two Mrs. Carrolls is a bizarre experiment in film noir and gothic horror, probably because director Peter Godfrey saw how well the blending had worked in past films (the aforementioned Suspicion and Gaslight) and believed it would be easy to copy. As with its predecessors, the talent assembled is formidable. Stanwyck and Bogart are evenly matched in terms of dominance; Stanwyck is no shrinking violet (although the second half of the story involves Stanwyck becoming far too friendly with the floor). It’s apparent from their whirlwind courtship of two weeks that this isn’t a grand romance, and while the line isn’t said during their relationship, what starts out as love turns into a “beautiful hatred” (I have to wonder if that was an intentional slight against Casablanca). If you’ve seen the films of which the plot borrows from you’ll understand where things go; in fact, The Two Mrs. Carrolls is so similar to Suspicion, complete with deadly milk, I had to ask why I didn’t watch that instead of this pale imitation. The problem isn’t the fault of the actors, but director Godfrey. The script is derivative considering the superior forerunners, and the actors don’t appear comfortable or understanding of their roles. I mentioned Stanwyck starting out as a strong female only to have her fall into a shrieking woman content to faint at the slightest provocation, which isn’t Stanwyck at all. The role calls for a Joan Fontaine or an Ingrid Bergman, and you can see Stanwyck reign in her performance. Even more removed from their element is Humphrey Bogart hoping to be a smooth-talking sociopath. Unfortunately, Bogart is too hard-boiled and rough for the role. His wild-eyed look comes off as outright loony and his gruff mood swings do nothing but show him as a stick in the mud. The script must understand this as the courtship between him and both Stanwyck and Smith is rushed; one minute the couple is flirting and the next they’re in love. The only one who is comfortable is Alexis Smith, who is gorgeous but has nothing behind her character. Is she a home wrecker or in on the plot? The script and direction of the plot doesn’t care either way and leaves her dangling in the breeze. 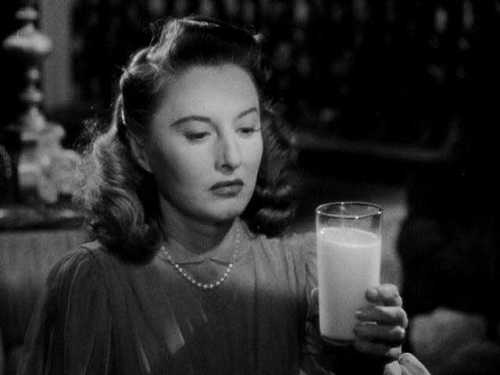 She shows up to stir the pot and get Stanwyck into bed, and that’s it. Little Ann Carter is here as Bogart’s daughter, Beatrice, but for some reason she’s told to act like Bogart’s wife/daughter. Her usage of big words and prim accent is lugubrious and weird; akin to Patty McCormack in The Bad Seed. At over 90 minutes, there’s enough story to sustain the runtime, but you’d never guess based on how quickly the script flies through events. I mentioned the quick courtships, but the script treats events like a cakewalk and has confidence that the audience will suss out things for themselves. You don’t need to understand why Geoffrey wants Cecily, just go with it; you don’t need to witness any distrust between Sally and Geoffrey, she’ll one day grow to distrust him; nor do you need to watch Sally analyze events and ask what does Geoffrey have to gain by her death, he just wants her dead! Part of this is because there are no grand motivations as there were in Gaslight or Suspicion (i.e. money); you just need to believe that Geoffrey is capricious and wants to move on. Overall, The Two Mrs. Carrolls is fun if you want to watch Humphrey Bogart play a fish out of water; Stanwyck and Smith are gorgeous, and I continue to find Ann Carter to be a good child star. Don’t go in looking for a plot as good as Alfred Hitchcock. This may have A-list stars, but the plot is C-list. You’re really getting my classic itch going. I may have to borrow your entire collection and then “keep it”. Also, I received Cleopatra. Thank you! Haha, well let me know what you think of Cleopatra. You’re more than welcome to come raid my DVDs and Blu-rays! I thought Humphrey Bogart was rather good in this role. The film shouldn’t be compared too much to Suspicion or Gaslight. Bogart had great success in a little known thriller called “Conflict” where he played a killer who bumps off his wife in order to marry a younger woman ( Alexis Smith ), and I think the studio was just hoping for another quickie picture like that. And in that aspect it succeeded. Another film in this category could be “My Name is Julia Ross”…that’s a great little thriller! Maybe I’ll enjoy Conflict. I love Bogart as a heavy, but I thought the role required more ambiguity, where you didn’t immediately believe he was bad (part of that is the script’s fault). I’ve heard of “Julia Ross,” might need to up that on the DVD watching list!